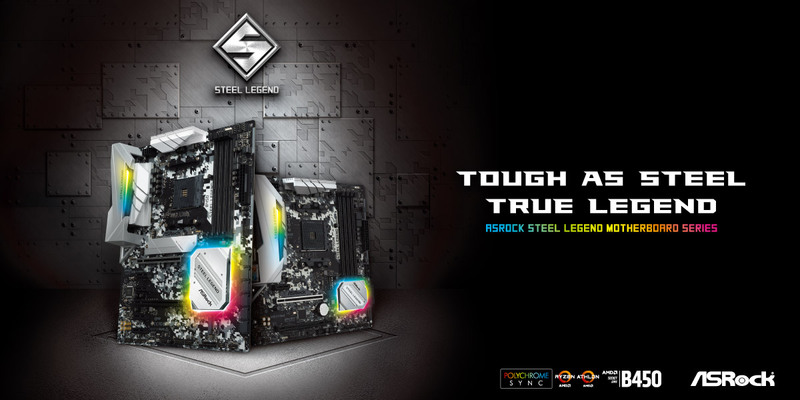 Be a True Legend with the tough as steel ASRock Steel Legend Motherboards | Planet 3DNow! TAIPEI, Tai­wan, Janu­a­ry 25th, 2019 – The lea­ding glo­bal mother­board manu­fac­tu­rer, ASRock, is proud to intro­du­ce the new ASRock Steel Legend mother­board series. ASRock Steel Legend mother­boards are built around the most deman­ding specs and fea­tures to pro­vi­de a wide array of mate­ri­als, com­pon­ents, and fea­tures that ensu­re sta­ble and reli­able per­for­mance. 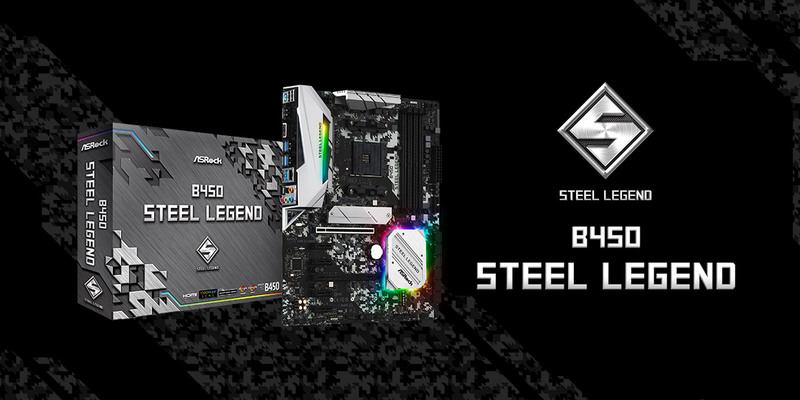 Steel Legend mother­boards stand out from the crowd through its mas­si­ve and luscious XXL Alu­mi­num Alloy Heat­sinks, I/O Armor, PCI-E Steel Slot, Poly­chro­me Sync (Address­able RGB LED) sup­port, and detail­ed PCB print on Sap­phi­re Black PCB for main­stream users, gamers, and pro­fes­sio­nals that choo­se to work and play in style. With sup­port for the latest AMD Ryzen pro­ces­sors, as well as high-qua­li­ty audio fea­turing the hig­hest qua­li­ty Nichi­con gol­den audio caps and signal shiel­ding inte­gra­ted into the PCB. ASRock has gone to gre­at lengths to ensu­re opti­mum sta­bi­li­ty and pro­tec­tion. With ASRock Full Spike Pro­tec­tion on all USB, Audio and LAN ports, users are always pro­tec­ted from Lightning/ESD dama­ge, which is a com­for­ting thought when using Steel Legend mother­boards in chal­len­ging envi­ron­ments. Use of Pre­mi­um 60A Power Cho­kes and Nichi­con 12K Black Caps means not only that the B450 Steel Legend and B450M Steel Legend will remain rock solid no mat­ter the task, but it also keeps your sys­tem sta­ble when over­clo­cking, for extra per­for­mance, whe­ther you’re gaming or ren­de­ring pro­fes­sio­nal con­tent. Inte­gra­ted AMD Store­MI sup­port means that the B450 Steel Legend mother­boards can deli­ver top-level sto­rage per­for­mance, while sup­port for AMD Cross­fire™ allows gamers to look for­ward to get­ting maxi­mum gra­phics per­for­mance from their sys­tem, which PCI-E Steel Slot ensu­res your gra­phics cards stays firm­ly in its slot, wit­hout suf­fe­ring from any exter­nal inter­fe­rence. With the per­for­mance, sta­bi­li­ty, and pro­tec­tion demands cove­r­ed, the B450 and B450M Steel Legend are rea­dy to sup­port you whe­ther you’re a pro­fes­sio­nal gamer or lover of high-qua­li­ty 4K con­tent. 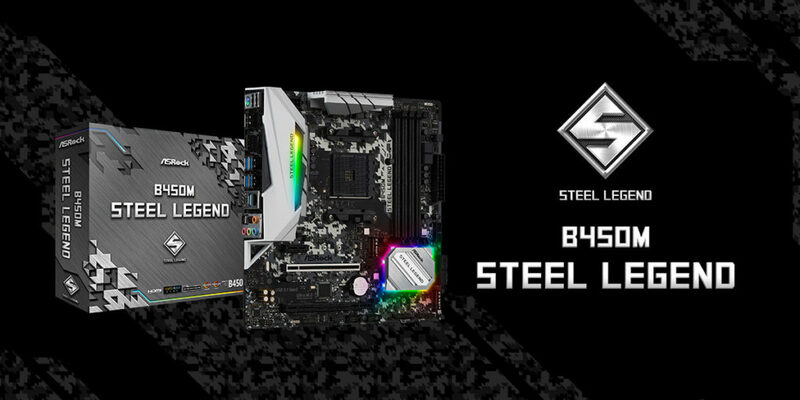 The B450 Steel Legend is a full-fea­tured ATX mother­board for first and second genera­ti­on AMD Ryzen™ pro­ces­sors with Rade­on™ VEGA gra­phics for socket AM4. The B450 Steel Legend comes with a full-fea­tured I/O panel which inclu­des HDMI & Dis­play­Port ports for 4K video when using AMD Ryzen™ and Ath­lon™ pro­ces­sors with inte­gra­ted Rade­on™ RX Vega and Vega gra­phics. ASRock’s uni­que M.2 Armor pro­tec­ts and enhan­ces the per­for­mance of M.2 SSDs. For con­nec­ting to a varie­ty of (gaming) peri­pherals, the B450 Steel Legend fea­tures two USB 3.1 Gen2 (Type A, Type C), four USB 3.1 Gen1 Type A ports, and a Com­bo PS/2 port with USB 2.0 ports for gamers still rocking their lega­cy peri­pherals. This Micro ATX ver­si­on packs the same punch as its big bro­ther, in a size opti­mi­zed for space-cons­trai­ned builds. Becau­se of the focus on size, the B45M Steel Legend fea­tures dual M.2 sockets that offer fle­xi­bi­li­ty for DIY users. It also pro­vi­des the same sta­ble power thanks to the pre­mi­um 60A power cho­kes and Nichi­con black 12K capa­ci­tors and also sup­ports up to DDR4 3533+ over­clo­cked memo­ry. No mat­ter the size, you can’t go wrong with the ASRock Steel Legend mother­boards.